MJ Wong was born into the w(r)ong family, then he fell in love and got married to the w(r)ong woman. Will he ever belong, will two w(r)ongs ever make a right? A dysfunctional family, a failed marriage; a happy family life has always managed to elude MJ Wong. How do you "grow up" without "grown ups" to look up to? How do you find your feet when your world gets turned upside down? How do you save on tomatoes at the supermarket? MJ Wong explores these questions through comedy with his unique blend of 'smart and dumb*' jokes in an often dark, but hilarious hour of comedic catharsis. 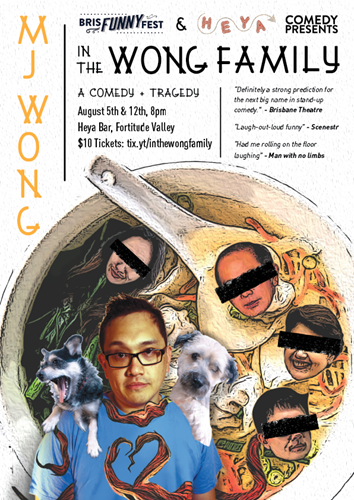 After performing across the country with the likes of Dave Hughes, Greg Fleet and Dilruk Jayasinha, MJ Wong debuts his first solo show spanning his culturally confused childhood, emancipation from his family, getting married young, experiencing the humiliation of infidelity to the even worse humiliation of online dating. Contains adult material, not suitable to children under 15 years. ALL UNDER 18s MUST PRESENT FOR A WRISTBAND AT THE VENUE DOOR.